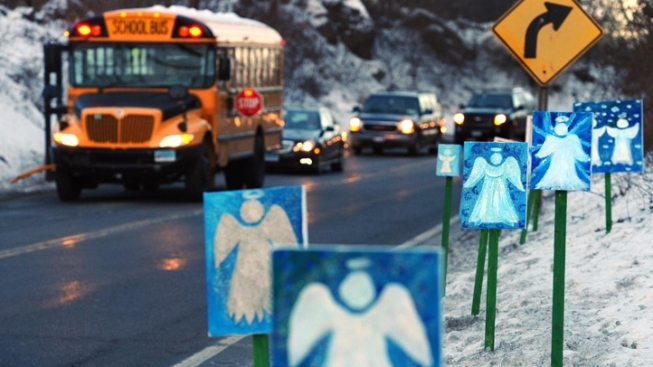 A bus traveling from Newtown, Conn., to Monroe stops in front of 26 angels along the roadside on what was the first day of classes for Sandy Hook Elementary School students since the Dec. 14, 2012 shooting. On Monday, the report on the investigation will be released. On Monday, prosecutors will release a long-awaited report on the investigation into the mass shooting at Sandy Hook Elementary in Newtown last Dec. 14. The Office of the State’s Attorney plans to publish the report around 3 p.m. on the State of Connecticut Division of Criminal Justice website. The report on the shooting that took the lives of 20 first graders and six staff members was supposed to be released in June, then was pushed back to the fall. Gov. Dannel Malloy said he agrees that the information should be made public and is glad the information will be released. Last month, he called upon the Chief State’s Attorney to release the final report. "I'm frustrated by the amount of time that it's taken and I think the longer it takes, the more things come out as opposed to being in an official report," Malloy said last month. "And I think the people of Newtown and families of those injured deserve it." Malloy said today that he has not been briefed on the report but is glad that the victims' families were last week. In advance of the report being issued, the interim superintendent of schools in Newtown has reached out to parents and sent a letter to ensure they’re prepared. "We all understand that for the children who were directly affected by this tragedy the release of the report and the upcoming anniversary can carry a very personal meaning," the letter reads.